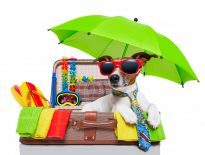 It wasn’t all that long ago that going on vacation meant purposefully being out of touch with day-to-day life for a while. Today smartphones, tablets, and ultra-portable laptops have changed the way we take a holiday. Cell phones are our cameras and navigational systems. We use them to make dinner reservations, to stay accessible if there’s a work emergency, and even monitor our pets in real time. Laptops are a good excuse to stay tethered to work, and tablets and TVs are go-to ways to to keep kids occupied. While some of these conveniences make traveling easier, they can make relaxing harder. A visit to Sandbridge Beach is an opportunity to slow down and ease into the rhythm of nature. Going low-tech or unplugged is a good start. Here are 10 vacation tips for unplugging at Sandbridge Beach. 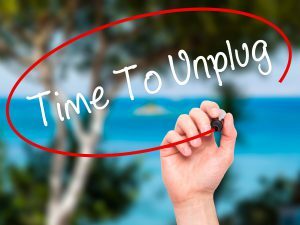 The first rule of unplugging is to get agreement from everyone, no matter how reluctant, to abide by the same guidelines. Whether you decide to go totally tech-free or set limits for screen time, make the rules clear. When you build excitement for how much more fun and relaxing it will be to fly kites on the beach or explore the coastline, you’re more likely to get compliance. Consider setting an “emergencies only” policy for phones. If you leave your phone on, or just plan to limit talk time, it’s too easy to slip right back into old habits. You can still use your smartphone for photos or navigation — just change the settings to block notifications. You could go the old-fashioned way and pick up a Sandbridge Beach visitor’s guide or map to help you get around. Let bosses, co-workers, family, and friends know you’ll be out of touch. For security reasons, don’t post your absence on social media, but do leave out-of-office messages on work email and voicemail saying you’re not available and the dates you’re inaccessible. Exploring the quiet beauty of Back Bay National Wildlife Refuge without interruptions is what a Sandbridge Beach vacation is all about. Leave a backup number for someone who can handle minor emergencies. Problem with your house? Let a trusted neighbor know you’ll be gone and leave the number of your handyman. At work, designate someone to field questions for you. Nobody wants their Sandbridge Beach dolphin-watching experience interrupted by the daily grind. If you do have a work or family situation that requires a check-in, schedule it. For example, some people find that a daily “All is well” text from a house sitter or caregiver gives them peace of mind. When you check in with work or family, establish a time and keep the interaction brief. After all, you’ve got to hit the pier in time to catch fish for dinner! Sandbridge Beach is known as the place to kick back, unwind, and spend your days fishing, swimming, and enjoying sunsets and sunrises. You might not even need a phone here, so if you’ve decided to go totally unplugged — no phones, tablets, or laptops — leave them at home. Most of us reach for our phones or laptops out of habit, or when we don’t have anything better to do. Before you leave home, plan the activities and pastimes you’ll enjoy instead of surfing social media or the Internet. This is especially important if you have kids who are used to online games as a diversion. Stock up on board and card games, let everyone pick out a new book (yes, a real paper one! ), and take advantage of the opportunity to learn to surf or boogie board. There’s a level of relaxation that can be achieved only by going completely screen-free for a few days. If your rental has a TV, unplug it. Spend evenings talking, walking the wide, quiet beach, playing games, or picking out constellations in the night sky. When you find yourself instinctively reaching for your phone — and you will — be mindful of where the urge comes from. Are you unable to let go of work? Feel like you’re missing out on news headlines? Need a social media fix? Just observing your technology habits can be one of the greatest benefits of a tech-free vacation, and it can give you insight into broader life changes you’d like to make. Also, pay attention to how it makes you feel to spend time with your partner or kids without phones or computers. Once you experience the true connection that comes with undivided attention, it’s strong motivation to keep that going even after your Sandbridge Beach vacation. Sandbridge Beach is an inspiring place to decompress, connect with loved ones, and slow your pace to the relaxing rhythms of nature. To deepen your experience, consider turning off your phone, leaving the laptop at home, and spending a few days just enjoying the simple life. Previous Previous post: March Madness: Memory Monday March 13, 2017. Next Next post: We were here! : Memory Monday March 20, 2017.